Here as usual is a perambulatory rumination on matters obliquely yet genuinely connected with organisational and community narrative. As always I beg your patience in seeing how it all fits together. I have been studying historical architecture for the past few months together with my seven-year-old son, and as part of this we have enjoyed David Macaulay's excellent books on architectural landmarks. A favorite is Mill, about the design and evolution of textile mills in 19th century New England. Reading Mill led to a discussion of where clothes come from, and how people grow and card and spin and weave and sew, and how the industrial revolution started mainly in the textile industry. This started us on a journey through the world of textiles that has given me occasion to reflect on many elements of contemporary life, including narrative elements, hence this post. I am not a stranger to sewing. I grew up watching my mother sew many of our clothes, and as a teenager and young adult I tried to do the same. But I was impatient and sloppy and wasted money on botched jobs. After we read Mill, I dragged out my old sewing machine, found my bobbins and instructions, and started to think about sewing again. Off we went to the fabric store in search of an easy pattern, but instead found a gorgeous pirate-style long coat that simply demanded to be created. So we created it with surprising ease. It turns out parenting comes with an automatic patience upgrade, so I am a more capable seamstress than I once was. And my son helped run the sewing machine, make measurements, pin pattern pieces, cut fabric, thread needles, choose stitches, wind bobbins and so on. Together we chose fabrics for the body, interface and lining; selected buttons and trim; and amended the pattern to improve on the trim design and add important details like real pockets and a broad collar. It was a true collaboration. The new coat is simply beautiful, all cuff and golden flourish. My son immediately began wearing it everywhere, and we have incorporated it into many of our pretend games. We have both been surprised by the outcome, and have since collaborated on a soft sweater he loves almost as much. (Next he wants a dress-up tie.) On his part, I'm not sure he believed me when I said we could make clothing. What surprises me is not that we could make something. What surprises me is what we made. It is most definitely not a coat. It is a negotiated construct, a composite story about us and our world, and I find it not that different from the constructs I have seen people build out of told stories. Around the same time we were building our coat, while wandering the aisles of the fabric store I came across one of those cheap plastic looms, the kind you use to make loosely woven potholders no sane person would actually use to hold a scalding pot. My learning-experience parenting muscle went into spasm, and I grabbed the loom and threw it into the cart. When we got home, the child showed no interest in the loom, but to my surprise, I did. I found myself getting it out over and over again, and I used up all the loops that came with it and went through an ancillary set as well. There was something profoundly calming in the simple act of picking up one thing and putting it over and under another thing. 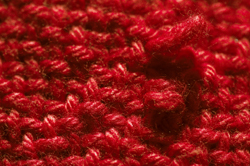 A lot of my middle-aged mom friends crochet or knit, but I can't seem to bear it. I suspect it has to do with having spent decades using my hands to poke at computers in small repetitive ways. But this little loom seemed to fit in somewhere, in a place where there was an inarticulate gap. This dovetailed with the next logical step after our sewing project: a discussion about where fabric comes from. We started to read about the various kinds of looms and their history and uses. I started wondering whether I could buy or build a larger non-potholder loom to play with in the evenings. If it had been summer I would have built my own loom, which looks easy enough; but it won't be warm enough to do woodwork outside for a few more months. So after much fretful comparison of options and costs, we ordered a laptop "rigid heddle" loom. Compared to real room-sized looms this is a toy, but it is more serious than the tiny looms that produce scraps of fabric. 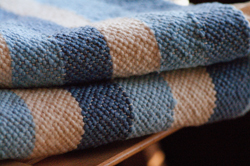 Some real weavers swear it can be used to produce excellent fabric despite its small size, and some even keep several around for small projects. My ideas of making fabric were like my son's about sewing: I wasn't sure it was possible but I wanted to find out. We got our loom about two weeks ago and have now produced about twenty square feet of miraculous fabric that slowly improves in appearance and stability as we learn. Our first cloth became a pillow cover for a huggable pillow that sits in our living room, and our second became a lovely red carpet suitable for rolling out on occasions of royal pomp (when you are seven such occasions arise at least daily). On the loom now is a soft baby blanket. You can predict what I will say next, I think. We ordered and received some simple hand carders, a drop spindle and a sampler of fibrous materials: wool, alpaca, camel hair, silk, flax. We have been slowly learning how to card and spin (guess why they call it a drop spindle? ), and our next woven masterpiece will include some hand-spun fiber. We will not be raising sheep, but we are eyeing the dogs and plan to collect and spin some of their soft fur as soon as weather permits. Our husky-mix practically sheds a cat in the spring. Flax apparently grows well in my area and will be in the garden next year. And I found out recently that stinging nettle, a scourge near our pond, can be made not only into a liver-tonic tea but also into yarn for cloth. The journey continues. So. What about weaving then? Much more than with sewing, weaving has been a revelation to me. More precisely, my reaction to weaving has been a revelation to me. I keep finding myself lying my cheek on the cloth I have just woven, rubbing it with my hands, even hugging it in my arms. What is it about sewing and weaving that draws me in so strongly? Confused by this reaction, I began examining it. My first thought was of the age-old interplay between comfort and freedom. As you move down the staircase of manufacturing from clothing to cloth to yarn to fibre, you give up the comfort of choosing a well-constructed piece of clothing from a rack and gain the freedom of building clothing that suits your needs perfectly. When you sew you can choose fabrics, colors, patterns, and trims; and when you have enough sewing skill you can amend patterns or do without them. When you weave you can create fabrics from yarns, colors, patterns and practices; and when you have enough weaving skill you can evolve new patterns and practices. When you spin you can create yarns from fibers, mixes and dyes; and when you have enough spinning skill you can blend fibers and create yarns with new properties. When you grow or harvest fibers you can nurture plants or animals so that they create fibers of particular types; and when you have enough growing skill you can open the black box of nature and begin manipulating its contents, breeding and arranging the elements of life itself. All of this takes time and effort, thus some discomfort in the form of real and opportunity costs, while it increases your freedom to range and build. What is the equivalent staircase of manufacturing in narrative? If buying a t-shirt in a store is the equivalent of watching a movie or reading a novel, what are sewing and weaving and spinning and growing and breeding? The sorts of narrative sensemaking activities I help people do in workshops seem like sewing. They start with premade stories and rearrange them to create garments with unique purpose and fit. But the pieces feel stitched together, not woven. Weaving stories is an involved activity that requires time and attention. When I sit with hundreds of stories for dozens of hours, I feel that I do weave rather than sew, and that what I create is more like cloth - for others to stitch together - than a garment. I don't believe I have any special ability to do this; in fact I think any individual or group could do the same. Experience matters, but the more critical elements are time and patient attention, just as in physical weaving. When you weave you must sit with and watch over every one of the thousands of strands that make up the cloth, just as if they were children under your charge. Errant strands can be brought into alignment, but yarn speaks and a good weaver knows how to listen to what the cloth wants to be and negotiate an outcome that suits everyone. Sitting with stories is no different. A two-hour or even a full-day workshop is not likely to satisfy those requirements, though I have seen some longer repeated sessions come close to crossing the line into weaving cloth. 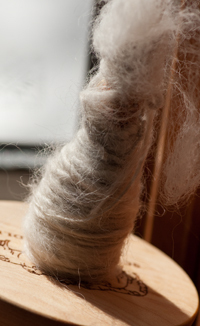 Spinning raw stories and growing story fibers ... are things few people have or take the time to do today. To get to that depth of involvement I think you need to consider griots and other story caretakers who learn their craft through years of apprenticeship and hone it over several decades. Some might say the great storytellers of novels and movies spin stories, but I don't think most penetrate to that level. Few new movies and books spin their own cloth. Many stitch together old stories; some weave old yarns; only a rare few still spin. Things are similar in the world of stories. Television shows are the ten dollar t-shirts of narrative and movies are the thirty dollar "nice shirts" at department stores. The expensive stories are those you build yourself from the raw material of time to talk to the people you know - a luxury few of us have in abundance. As a result only the rich have strong, beautiful personal story garments. The rest of us walk around clad in story tatters. I read somewhere that before the factories came, nearly every house and hut had a spindle or wheel and loom sitting beside the fireplace. Did every house have a story loom too? What sits there now? You know what it is. It's the business end of a story factory. One of my favorite bits of literature on narrative is Stephen Crites' chapter on stories and life, in which he says that people live in sacred stories and with mundane stories. Over the past week I keep walking around and just looking at my house as though I have never seen it before. In one sense, I haven't ever seen it before. I can now see that I live with many of the objects in my house, but in few of them. What exactly is missing in our world of store-boughten things? Marx told us what, and so did Lefebre, Boudrillard, de Bord, Ruskin, Morris and many many others. I've been reading more of that literature lately, trying to find explanations there for my feelings. People say that industrialization destroys quality, abuses workers, alienates people from products and limits the expression of self. This is all true, but what I have been feeling lately has little to do with any of those things. What I see is that the things my son and I have created, unlike anything else we own, are conduits of contextual connection. They are strings we have woven to create a life together out of one cloth, both figuratively and literally. We chose the yarns and colors, we calculated the ratios and patterns, we took turns pulling the warp yarn through the heddle and passing the shuttle back and forth. Some of the lovely mistakes in our cloths are mine and some are his, intermingled. It is not our cloth: it is our story. In contrast, some - but not all - of the built objects I have bought and brought together around me seem less like conduits and more like walls. They don't connect us but stand between us. Thinking about everyday objects in terms of context and connection brings a stronger analogy with stories than thinking about comfort and freedom. The things I see around me that act as conduits all have, or represent, or are, stories. The last cloth I can remember feeling this attached to is in a tiny hand-woven poncho my grandfather bought for me on a trip somewhere out West, probably when I was about seven myself. At that time, the idea that my one living grandparent knew I existed filled me with wonder, and I displayed the poncho in my room like a museum piece. That poncho still brings back strong memories of my grandfather and stands out from all the junk in my house like a gem in a coal mine. Here is the question I keep asking myself lately. What proportion of the total number of objects in my house is made up of conduits? Is it twenty percent? Thirty? What proportion would have been conduits two hundred years ago? Seventy percent? Eighty? What would it be like if everything you saw was a story about your web of family and community? What would that be like? It is hard to imagine such a world, but that was the world people lived in for almost all of history. I keep walking through rooms trying to imagine every item of clothing, every piece of furniture, every dish and spoon, every decoration, every window and door and floorboard, telling stories. In comparison I feel like a visitor in my own home. Am I saying bought objects cannot represent conduits of contextual connection? No, not at all. Within an arm's reach you and I can surely lay our hands on items we bought and subsequently endowed with rich meaning. However, I lay you odds ten to one that any such objects around you were bought years ago, not recently. It takes longer to build a conduit out of something you encountered only late in the story of its existence. If a cloth was already woven when you got it, you can't weave it again; you can only sew it in at the edges. But this does not mean I believe everyone should rush "back to nature" and consume nothing but the products of our own labor. I don't think people are that devoid of ingenuity. We can and do build with what we are given, even if it is already built when we get it. And I agree with those who say we create bricolages of bought products that express our individuality and build connections. My feeling is not that we are wrong, but that we are poor. We get by with much less than we need, and that's sad. Our contemporary state of conduit poverty is not my point either, really. What bothers me about the low proportion of story-conducting items around us is that it appears to be higher than it really is. Bought items, mostly by design, appear to contain more stories than they actually do, and that is what I think is dangerous. When we mistake walls for conduits we mistake disease for health. My husband pointed out, when I told him this argument, that it bears an interesting resemblance to similar points made in the books The Pleasure Trap, Supernormal Stimulus and Eat for Life. The argument in all of these books goes like this: we crave something; we look for that thing in the wrong place; we consume something we think will suit our needs; our craving is partially satisfied, but only partially; we know of nowhere else to look, so we consume more of that thing; it still only partially satisfies our craving; and round and round we go, getting fatter and fatter in one way while we starve in another. There is one method of building conduits around which I have decidedly mixed feelings. It is the phenomenon of mass customization. In my textile travels I was excited to find the Spoonflower web site, which sells a service using which you can upload your own visual design and receive cotton cloth with that design printed onto it. This is only one example of many such sites such as ponoko.com in the "personal factory" movement that help people inject context into built objects, in effect drilling conduits through walls. I can see how this approach can help people enliven and enstory their surroundings. I already have plans to design some drawings with my son and use them to build clothes that embody our stories. But I don't feel mass customization is enough all by itself. If we are to come to a new age where we live in our stories again, we should use every means to get there, but mass customization cannot be the only means. We must maintain the ability to venture down the staircase and make things ourselves. I get nervous when there is a black box we cannot open whose products we must take on faith. I want to know I have the option to get back to the source, even if I do not use it. If I want to grow my own flax and make a shirt of it, I want to know I can do that, even if I don't. Show me a device I have some hope of building given time and attention, and I'll use it to inject meaning after the fact. But don't use it to bar my way. I was thinking about all this the other day as I put away some clothes, and the clothes started to sort themselves out by the stories they told. Some of my clothes tell no stories at all. These are clothes I bought for abject utility, usually because I didn't have time for laundry and wanted to stretch out the supply a little further. They are cheaply made and untrusted. They might be someone else's clothes for all I know or care. They are like the almost-stories you find in instruction manuals: if you push this button, this panel will pop out. Generic. Walls. In the mid-range are clothes I bought because they seemed to match my personality at the time - I thought I saw myself in them - but I was mistaken and they did not suit. Those clothes are like situation comedies on television: the feeling of resonance with your life lasts about one minute longer than the laugh track. I used to get clothing catalogs full of clothes (due to the divine grace of CatalogChoice.org I am no longer burdened by such things), and I sometimes watched myself looking through them. You may have noticed this as well. I never looked at the clothes. I looked at the people. If a woman looked like she was like me, not in physical appearance but in attitude, beliefs, fears maybe, like what I was like inside, I wanted to buy what she had on. Of course, when I actually did buy what she had on, I was almost always disappointed. I had gone looking for something where it could not be found, and I did not find it. This is similar to the way in which people watch television shows for the escapist friendship fantasies they contain while eroding their time to pursue the real thing. These clothes can seem like conduits for a brief moment, but they are actually walls. Next there are the folk-tale clothes, ones I bought because I wished I could wear them or felt I should wear them - frilly things, business-like things, trendy things - but found I remained myself even with them on. They did not have the power to change who I am inside. The great majority of these clothes mean nothing to me; they could disappear and I would feel nothing but relief. Once in a great while a folk-tale item does cross the line into the sacred, but this is only because it was initially misclassified as fictional. Three types of clothes tell sacred stories. The first is the accidental discovery of myself, when I have wandered through a store or poked through a web site and found myself there. As I said, this can seem to happen before the purchase, but it can only be proven years afterward. I can count these items of clothing on my ten fingers, but I wear them until they fall off in tatters. They take on formative qualities, names, rituals. My holey pooh shirt is only worn on International Days of Self-Pity. I have recently acquired a Firefly t-shirt which is only to be worn on Days Of Great And Courageous Challenge, but at this point it is still in the folk-tale stage and may or may not prove sacred in years to come. Other items are too ridiculous to divulge in public, but suffice it to say that even a pair of socks can have magical powers in times of need. When I have the good fortune to find this sort of clothing for purchase, it is like the movie or novel I feel has been written exclusively for me, and about which I feel intensely embarassed that anyone else has seen it. I remember coming out of a few movies with friends and finding myself unable to speak while they carried on the usual discussion about plot holes, because the story was accidentally my story. These finds are precious because they are so rare. I think half of the reason people buy clothes is to find these gems, and that's probably half the reason people go to movies too. The second-most powerful type of sacred clothing is clothing somebody chose for me. I have shirts and sweaters my parents or siblings or husband gave me that I would never pick out for myself, that don't suit my style at all. But they do suit me, because what I am more than anything else is a person who has parents and siblings and a husband. The fact that I would never wear a sweater with little pom-poms on it is beside the point. Even things I received with initial embarassment as being too kitschy or uncool to grace my house or self have become badges of belonging as time goes by. These clothes are large open conduits, and I sometimes wear them ritually in order to have a loved one near me in times of trial or stress. Clothing actually made for me by people who love me is of the strongest possible meaning. I have precious few of such items, which is no slight to those who love me. I once had more but lost many things due to the blindnesses of youth. In some ways my late discovery of the contextual conduits was gently nurtured by my siblings, three of whom have consistently given home-made gifts that resonate thoughout my house like an endless family reunion. I can now add a fourth category of sacred clothing, one I had once known but had forgotten: clothing I have made sacred by building it myself or in collaboration with a loved one, human or otherwise. I have only begun to explore what the conduits made of this clothing might be like. My initial reactions are strong, but after the novelty wears off I suspect they will not surpass the made-for-me group, because no matter the connection a gift is a gift. So there I was having these thoughts while trying once more to jam my abundant, comfortable, anonymous clothing into the dresser I had used since childhood and which my grandparents had used before me. It is a dresser that was built in the days when clothing meant something, so of course it is too small for what I own. I began to have a radical thought. What if I owned no non-meaningful clothing? What if every item I owned was sacred, by accident, gift or creation? What would that be like? I find myself excited by this idea. I think I could easily give away most of the clothing I own and be happier for it. I would say the proportion of my clothes that fit into the sacred category is no more than twenty percent. Why do I have all these other things? Why do I keep them? Why did I buy them? What would happen if I stopped buying meaningless clothes? I would have to wash clothes more often, but what of that? Washing clothes would itself become an act of meaning, a visit to friends instead of a mindless drudge. I nearly had a heart attack when I had to cut into my first woven fabric to fashion it into a pillow cover, and I wonder if the rise of mechanical washers went hand-in-hand with the rise of mass-produced clothing because people were willing to let meaningless clothes be ruined by the heavy hands of thoughtless machines. Certainly it is far more through washing than wearing that our clothes fall apart over time (try googling "washing machine ruining clothes" and you'll see what I mean). We take care of the things we love. This brings to mind the book Material World. This amazing book shows something like twenty families from all over the world sitting in front of their houses with all of their belongings spread out around them. The juxtaposition I always remember is between a family in Texas with enough material goods to support a village and a family in Nepal with something like ten bowls, five hoes and a bedsheet. I'm exaggerating but you get the point. The first several times I looked over the images in this book I focused on the things and what they said about economic disparity. But now I find myself getting out the book again and looking for contextual conduits. Which objects link the people to other people, and which do not? It is probably impossible to tell, because who am I to know your context; but I do notice that the things people have in front of or close to them seem more meaningful to them than the things behind them. The Texas family holds their Bible proudly in front of them while the Nepalese display their metal bowls, which may be religious in nature, almost as mediating representations of themselves. As I look at these pictures I am finding I envy these people in proportion to how many possibly conduit-forming objects I see around them. My favorite photograph now is of a Guatemalen family proudly displaying their spinning wheel, two large looms, and entire family wardrobe of hand dyed, spun, woven wool. What wealth, what finery. What hypocrisy, you say. Yes, it's all fun and games when it's not your only option. I agree. Throw me into a mud hut and force me to grow my own things and I would surely pine for smooth sheets and a refrigerator. And it is surely ridiculous for a person who lives in a house with a floor, even a cracked linoleum one, to say anything about envying people who live in precarious, unsanitary conditions. But maybe we don't have to give up contextual wealth to gain financial wealth. That seems to be the bargain we are living under, but maybe our next utopia should be one where physical and social needs are met together. I am reminded of Ursula K. LeGuin's utopian novel Always Coming Home, which puts forth a vision of technology used but controlled within a moral framework that asks the difficult questions we put aside. I like the idea of society molding its use of technology to our needs rather than molding our needs to the available technology. After this revelation at the dresser I found myself jumping over the wall of analogy into the land of stories. What would happen if I owned no non-meaningful stories? What if I cleared out my story dresser? What if every story I experienced was sacred, by accident, gift or creation? What would that be like? I don't know.